(not heard of them, but of course you've heard of them, too!). Ciara getting down to some very serious silly business. That's because everywhere this upbeat, fun troupe goes, it can get pretty LOUD. In Character and in action! And they have been getting loud for the last fourteen years, spreading a message of positivity, with an emphasis on making good choices and saying NO to drugs, and NO to bullying. Robin hanging with the Huntsville Elementary peeps. This is a homegrown Huntsville thing, and current squad members once sat on the floor in the audience and thought, "When I get to high school, I am going to be on the S.O.A.P. Squad!!" Rapt Audience at Huntsville Elementary School. So let's face it, if you know a child that has attended Huntsville ISD in the past decade and a half, we guarantee they have laughed and listened to the skits and of course sung along to S.O.A.P. Squad classics like, "I'm drug free as you can plainly see, and because I am drug free, a carpenter I can be. Two by Four, Nail it to the Floor!" The kids get a chance to say "hi" to the big kids- High Fives for Everybody!!!!!!!!!!!!!!!!! It's light hearted for sure, but it's important, too. I'm a Plumber! I'm a Carpenter! I'm a Mother! I'm a Cheerleader! Who was that orange blur? AND a special guest star at the performance at her school! Greetings from our Sumptuous Dressing Room! Do we have the horsey head? Check. Do we have the Bugs Bunny? Check. Do we have the gold cape and bandana? Check and Check! These S.O.A.P. guys and girls are pretty dang wacky! leads the kids in a pledge to be drug- and bully- free. Is it time?! Jared thinks so, Julian's not so sure. It's a family thing for S.O.A.P. Squad members sister Keona and brother Demarcus. 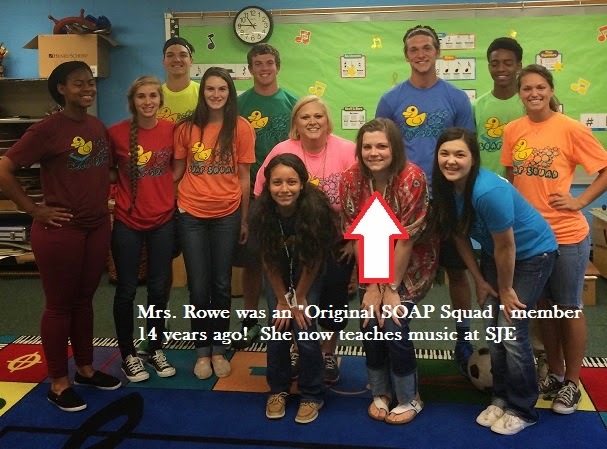 Scott Johnson's Music teacher Mrs. Rowe was one of the original S.O.A.P. Squad members!! S.O.A.P. Squad fan Principal Beth Burt was spotted at the Samuel Walker Houston Elementary School performance. The Squad hanging out between performances.